If New York City is the Big Apple then Downtown New York is its core - the epicenter of New York City where you can take your picture with Wall Street*s Charging Bull walk to trendy local shops and restaurants visit a museum or simply take in the breathtaking harbor views. 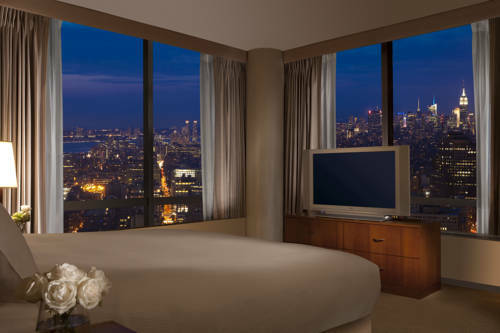 And located in the heart of Downtown New York - the Millenium Hilton Hotel. Conveniently located in Downtown New York*s World Trade Center /WTC/ / Financial District the Millenium Hilton Hotel is just minutes from renowned New York neighborhoods financial institutions and the landmarks that define the New York skyline Wall Street - 0.5 miles SoHo - 0.5 miles South Street Seaport - 0.5 miles Tribeca - 0.5 miles Battery Park - 0.75 miles Statue of Liberty / Ellis Island - 0.75 miles Greenwich Village - 1 mile. From redesigned dining experiences to state-of-the-art meeting and event facilities - our New York City hotel has been carefully designed for your modern travel needs. In lobby hotel Concierge Heated indoor swimming pool overlooking New York City Hilton Fitness Center by Precor 24-hour business center Chic lobby bar Liquid Assets Church - Dey Restaurant serving authentic American regional cuisine 3 500 sq. feet of meeting - banquet space In-room amenities such as plush Hilton Serenity Bed 42* plasma screen TV High-Speed Internet and Hilton Clock Radio with MP3/iPod docking station. Whatever your reason for traveling the goal of our hotel is to make your stay as enjoyable as possible. For an exceptional New York City hotel experience just minutes from everything in Manhattan - make your reservation today at the Millenium Hilton Hotel. Travel is more than just A to B. Travel should take you places. This newly-renovated lounge is located in the main lobby of the hotel serving up signature and innovative cocktails. This newly-renovated bar is located on the 3rd floor of the hotel adjacent to Church - Dey Restaurant. Sip on a refreshing cocktail and enjoy light fare from our bar menu while overlooking the stunning World Trade Center site.